Bristol Herald Courier Still Fake News? Sent to the Bristol Herald Courier 8/17/2018. Re: "We've Been Complacent". The "Press" has no right not to to be called out or questioned. Questioning the "Press" isn't un-American, but American. Mr. Trump has not eroded public confidence in the "Press": political correctness, bias, and identity politics has. The Bristol Herald Courier openly participated in this coordinated effort to attack Mr. Trump today. That doesn't include informal collusion we've dealt with since 2016 holding millions of "deplorable" Americans in contempt. Stop whining when called on it. The "Press" behaving as a Pravda arm of the DNC is no victim. Bias, censorship, and propaganda go beyond the editorial page. I'll cite examples of fake news this very "newspaper". Let's put aside hysterical national reporting of the shooting of "unarmed" black men which in nearly every case was justified. The "Press" censors and covers up the culture of violence and criminality within minority communities. That censors the real reason for massive confrontations with police. Insinuating disproportionate numbers of non-whites, etc. are in prison over racism is a damn lie. During the August 4-5 weekend 70 people shot, 12 died in Chicago at the hands of blacks. "We know who they are" says the community, yet the "Press" censored the identity of those creating this carnage. Almost as many blacks died in 1 weekend by blacks in just Chicago than unarmed blacks by police (about 17) in all 2017. Yet "fake news" is quick to name the cause as guns, poverty, gangs, etc. without proof. Surprised they didn't include Confederate statues, Trump hats, or the KKK which is a joke with near zero support. They inflate these KKK numbers far out of proportion for shock value. That's fake news too. Another Muslim fundamentalist terror attack took place in London while the details of the attacker were hidden or played down. (Page A4 August 15.) Described only as "a British citizen from another country" hid both his identity and his almost certain religious motive. Does this really help Muslims? Over 100 cars were burned in Sweden yet a check of foreign/domestic news sources save one hid the identity of this coordinated attack. We get the usual "poor neighborhoods" canard while only the Israeli press identified the Muslims behind this. Censorship, creating a false narrative, is "fake news". Bristol Herald Courier August 12, "Over the Top" page A4. Starting off, "white supremacist violence..." was a lie - it was leftwing violence when police WERE ORDERED to stand down allowing ANTIFA, BLM, etc. and other DNC shock troops to attack KKK scumbags. I know police that were there and this came from them. If the police were not allowed to do their jobs like last year violence would have occurred as 200 DNC storm troopers (excuse me peaceful protesters) would have attacked the two dozen Neo-Nazis. They verbally abused the police instead. Slanting the news as this report did is fake news - the bias in this report can't be denied. Playing up white racism while censoring or covering up minority criminality, leftwing racism, and violence is fake news. President Trump spoke not against the "Press", but fake news, bias, and propaganda. 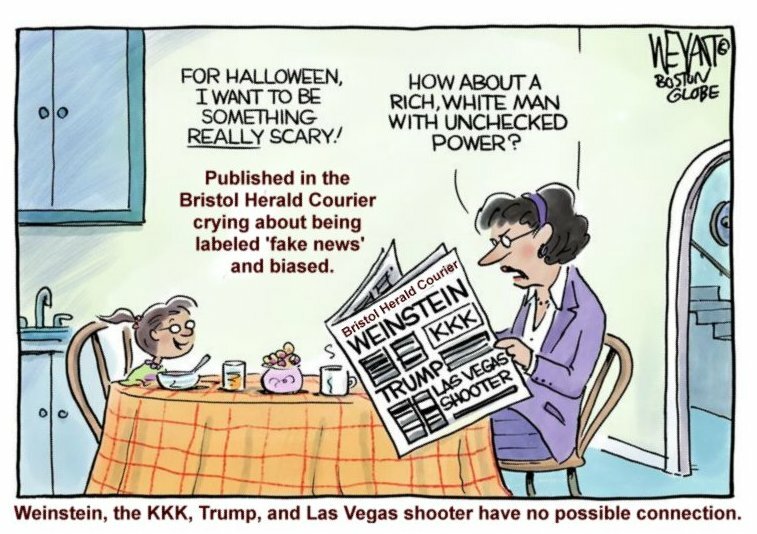 The Bristol Herald Courier is fake news as I went through 2 months of newspapers before the election in 2016 and the attacks on Mr. Trump was running 30-40 to 1. Letters to the editor virtually banned - bias is fake news - knowingly reprinting bias makes a newspaper fake news. Reprinting hysterical, inaccurate news reports could have incited violent black male Lakeem Scott to murder a white mother of 2 on Volunteer Parkway. He wanted to kill white people for revenge based on faulty "fake news" reporting. That doesn't count attacks and murders of police caused by "fake news". I'm calling this "newspaper" out for fake news and it is no victim - the dead mother of 2 on Volunteer Parkway was. Nobody is stopping the Bristol Herald Courier from printing anything it wants or censoring what it wants. Worse, you are racist because racism is treating people differently based on race. If you want to peddle Blue State DNC liberal fascism and racial socialism then don't whine about criticism or that we don't trust you. You take sides then live with it snowflakes. Ref. Aug. 4-5 weekend 71 shot 11-12 dead. 12,601 shot since 2012. Ref. Conservative Tribune Aug. 9, 2018. US dead in Afghanistan: 2016 - 14; 2017 - 15; 2018 - 2? In Chicago, 1,876 people have been shot this year. That is 473 fewer than 2017. Data through Tuesday, August 14, 2018.